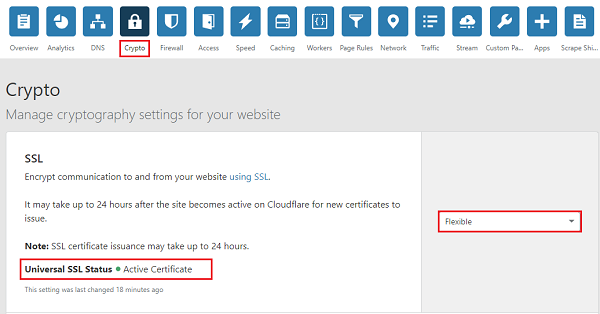 How to Setup Cloudflare Free SSL Certificate for WordPress? Google officially announced “HTTPS as a ranking signal” on 06th August 2014, meaning that websites using SSL have more chances to get higher rank in Google’s search results page. At that time, only 1% of global queries were affected with this change but now in 2018, it seems Google has strengthen it and most of the websites on Google’s search engine results first page are HTTPS. Back in 2014, switching to HTTPS was very expensive but today in 2018, there are many web hosting providers who offer free SSL Certificate with their hosting package. If you are planning to get a free SSL Certificate with hosting plan, you can register either SiteGround or BlueHost. If you already have a hosting plan with no free SSL certificate, you can get it absolutely free with Cloudflare. Cloudflare is one of the world’s largest cloud network platforms. They are trusted by over 12 millions domains. Cloudflare provide your global users a faster, more secure, and more reliable internet experience. Cloudflare is offering Free SSL Certificate for WordPress users. You just have to follow below steps to create a free account with Cloudflare and setup free SSL certificate on your WordPress blog. 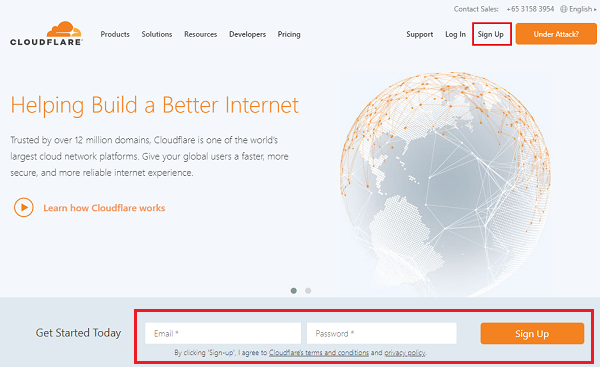 STEP-1: Click here to visit Cloudflare website and then click Sign Up button or you can simply enter your email address and password to register your free account with Cloudflare. STEP-2: Next step is to add your website to Cloudflare. If you would like to add more than one domain name, click “I’d like to enter more than one domain at a time” and add all your domain names for which you want to get Free Cloudflare SSL Certificate. STEP-3: Select your “FREE” Cloudflare plan and click on “Confirm Plan” to proceed further. This plan includes Global CDN, Unmetered Mitigation of DDoS attacks, Free Shared SSL Certificate and much more. STEP-4: On the next screen, Cloudflare will query your site’s existing DNS records and automatically import them, so that you don’t have to enter them manually. Now review your DNS records and click on “Continue” button. The next screen will show you your existing DNS nameservers and Cloudflare DNS nameservers as shown in below snapshot. 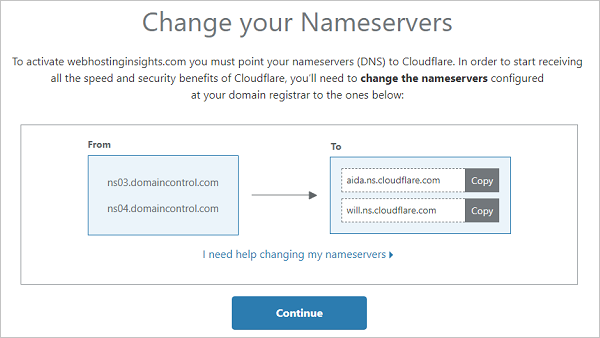 You have to change Cloudflare DNS nameservers at your domain registrar. STEP-5: If you are registered with GoDaddy, Sign In to your account with your login credentials. Go to Domain section, Click on Manage in front of your domain name (like webhostinginsights.com). Scroll down to the bottom and click on Manage DNS. 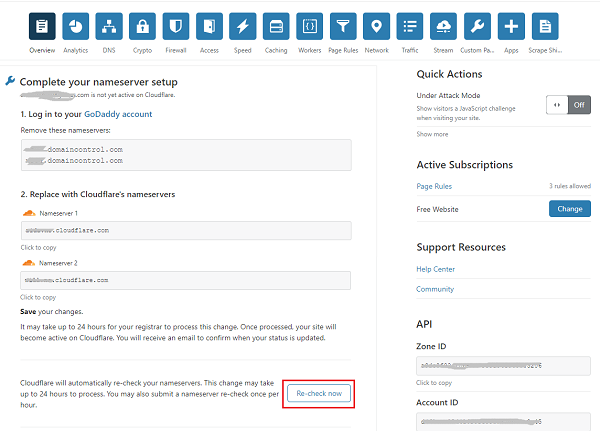 Next, click on Change Nameservers > Select Custom option from drop-down menu and enter Cloudflare nameservers. Click on Save button to make the changes permanent. Sometimes you will see below screen, where you will be asked to replace GoDaddy nameserver to Cloudflare’s nameservers. This screen comes when you click on “Continue” button on “Step-4” before changing the Cloudflare’s nameservers. But don’t worry, you can still click on “Re-check now” button at the bottom of this page after changing Cloudflare’s nameservers at your domain registrar like we did with GoDaddy. STEP-6: Go to “Crypto” option at the top of your account dashboard. Select “Flexible” from the drop-down menu and you will see a message that “it may take up to 24 hours after the site becomes active on Cloudflare for new certificate issue“. Generally SSL Certificate activation takes less than 10 minutes, if you website is live. But sometime it takes up to 24 hours. If you are still not able to get the SSL certificate activation, do write in comment section. We will definitely help you to find out the root cause. STEP-7: Next, you have to change some recommended configure settings. Under “Crypto” option, scroll down and enable “Always Use HTTPS” and “Automatic HTTPS Rewrites”. STEP-8: This is very important part for enabling free Cloudflare SSL certificate on your WordPress website. You need to create a page rule for your website. Go to “Page Rules” > Click on “Create Page Rule“, a new dialog box will open. 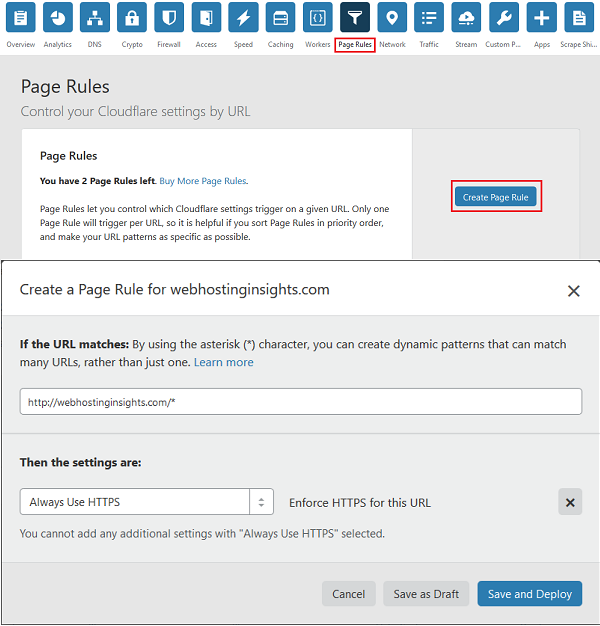 Enter your website URL like http://webhostinginsights.com/* and select “Always Use HTTPS” from drop down. Click on “Save and Deploy“. That’s it. Congratulations! you have successfully created and configured Cloudflare Free SSL account. First login to your WordPress website dashboard and install CloudFlare Flexible SSL Plugin. STEP-9: CloudFlare Flexible SSL Plugin is very important for enabling Flexible SSL on your WordPress website. It will prevent infinite redirect loops when loading WordPress sites under CloudFlare’s Flexible SSL system. This plugin has more than 100,000 downloads and supports 3.2.0 or higher WordPress version. STEP-10: Final step is to change your Site Address (URL) in your WordPress website’s dashboard. Go to Settings > Click on General option and change Site Address (URL) to https://, but make sure you leave the WordPress Address (URL) as http://. If you change WordPress Address (URL) to https://, it will break your site. If you change your Site Address (URL) to https:// without Cloudflare Flexible plugin, it will also break your website. Congratulation! Your WordPress website has been setup with Free Cloudflare Flexible SSL Certificate. Now open your website in a browser and check whether it is working or not. If you are getting an issue while accessing your SSL website, just follow below steps again. Step-1: Disable CloudFlare Flexible SSL Plugin and then Enable it. Step-2: Go to Settings > General > Click on Save Changes and leave your website for 10 mins. I got the same issue with one of my websites, I did above troubleshooting and finally my website started on free Cloudflare SSL Certificate (https://webhostinginsights.com). Once your website is started running with HTTPS, You will see a green lock on the top left of your address bar. Don’t forget to write us, what’s your opinion about Cloudflare free SSL Certificate? If this article helped you in getting free Cloudflare SSL certificate, feel free to share and comment below.